Incat Crowther signed a design contract with Cape Town based shipbuilder Veecraft Marine for the supply of a 20m monohull workboat for the South African National Defense Force, tasked to transport personnel and equipment and support training activities in coastal areas up to 10 miles off the coast under inclement weather conditions often experienced in the area. The vessel is designed in accordance with BV requirements and in compliance with flag state rules as defined by South African Maritime Authority (SAMSA) for Category C vessels. The main deck features a forward deckhouse with wheelhouse above and a generous 25 sq. m. aft cargo deck. The modestly sized deckhouse is fitted with galley and mess areas along with two bathrooms and a deck locker accessible from the cargo deck. The wheelhouse is arranged for 360-degree visibility, including an unobstructed view of the cargo deck. The cargo deck of the aluminum vessel is able to accommodate a 6m ISO container and is also fitted with a 5t marine crane. A foldable dive platform is fitted aft of the transom along with stairs integrated into the main deck to provide safe access. Below deck includes two 7.5 cu. m. cargo holds with access hatches above, engine room, fuel and water tanks, and a crew accommodation space. The crew accommodation features three staterooms each with three bunks for a total capacity of 12 crew members. Other notable features include a robust fendering system and heavy towing bollards on each end of the vessel. 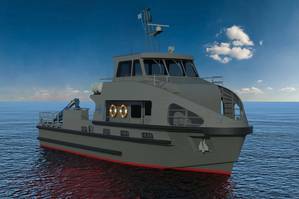 With a modest service speed of 16 knots at a healthy deadweight load of 20 tonnes, the vessel will be powered by two MAN D2862 LE431 marine engines rated at 588kw at 1,800 rpm driving Teignbridge fixed pitch propellers through ZF 2050 gearboxes.